← Boom!!!! Media Served Notice!!!!!! And, “Fake News” Isn’t Going Away!!!! So, much of the world is having a panic attack because of again. It’s a strange thing, this panic attack, because most of what he stated is incredibly obvious. (one could have come to most of these conclusions if people had read some of my earlier Suyts writings). 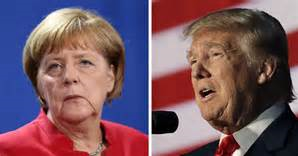 Merkel told reporters in Berlin when asked about Trump’s criticisms, adding that she will work towards getting the EU to strengthen the economy and fight terrorism.